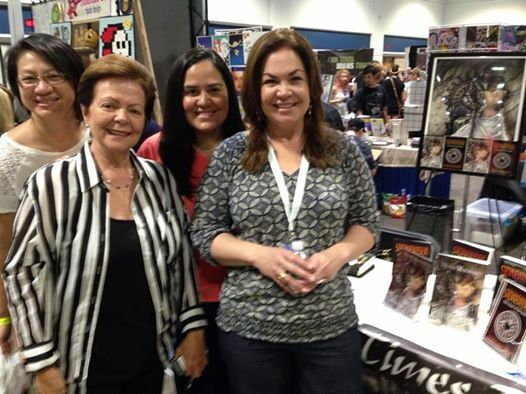 We had a blast at the Tampa Bay Comic Con this last weekend. Along with my Twilight Times Books colleagues, Scott Eder and Maria DeVivo, we enjoyed an exuberant celebration of fantasy and science fiction in books, television, movies, and videogames. The Con was a triumph of the human imagination. It was fun, chaotic at times, but supremely entertaining. My favorite? The panels. 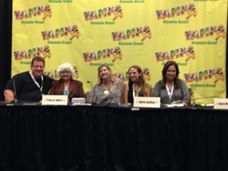 Maria, Scott and I sat on several panels together with authors Tracy Akers and K.L. Nappier, to discuss the best novel-to-movie adaptations, building believable worlds, and character development. It was the first time that writing panels were included at the Tampa Bay Comic Con, thanks to the efforts of Tracy Akers and Scott Eder, who organized the panels. The result were great. Not only were the panels extremely well attended, but they were also full of clever readers who knew their fantasy, promising aspiring writers, geniuses disguised as kids, and a host of fascinating characters. We had awesome discussions with amazing audiences. I really enjoyed hanging out with my fellow authors, meeting so many smart and interesting readers, and sharing my writing experiences with folks who love writing, reading and fantasy as much as I do. Twilight Times Books colleagues Maria DiVivo, Scott Eder and me in the middle. Dear friends and family stopped by the TTB booth. 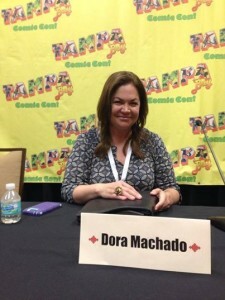 Yours truly at one of the panels. At one of the panels. 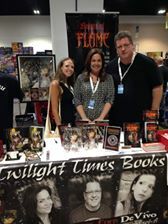 From left to right, authors Scott Eder, Tracy Akers, K.L. Nappier, Maria DiVivo and yours truly. Thanks to all of you who stopped by the booth to say hello, all the attendees of the awesome panels, and to the organizers, employees and volunteers of Tampa Bay Comic Con for putting together such a great event. You are currently browsing the archives for the Tampa Bay Comic Con category.